This third-party app allows you to quickly search the full Stack Exchange network of sites from your iphone or ipad. It is nice for when you are away from your desktop or in a meeting and want to search for a quick answer on a Stack Exchange site. 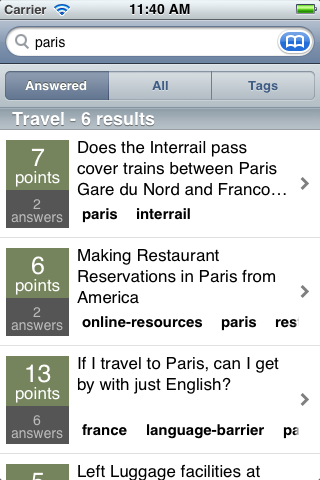 The app supports both tag and in-title search strings as supported by the 1.1 stack exchange API. Answered / "all results" filtering for all search types (This no longer requires another internet call). This can be toggled via a button above the keyboard when it is shown. Moved site selector out of the search box and into a bar above the keyboard. fixed a bug that locked images at 100 pixels wide.